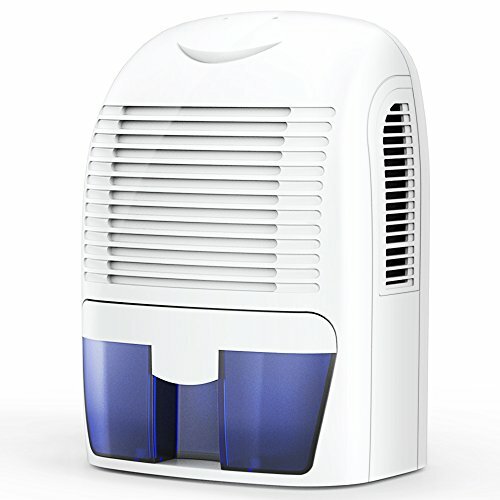 The compact air purifiers dehumidifier uses Peltier Technology (no compressor) which makes it light and quiet. It is perfect for small areas up to 15-25 square meters including bathrooms, basements, bedrooms, kitchens, closets, small laundry rooms where dampness and humidity are a problem. 1. Large 1500ml capacity water tank. 2. Auto-Off and LED indicator when full. 5. Noiseless when you sleep at night. 6. Updated design give you a whole new experience. 7. Tiny and easy to carry. 1. Do not place the power adapter in a wet or damp place to ensure the dehumidifier can work safety in a well-ventilated area. 2. Wipe clean with a soft damp cloth, do not use harsh or abrasive cleaning products. 3. Keep the front air inlets and side air outlets free from being blocked when the dehumidifier is working. 5. The dehumidication performance is affected by many factors, such as the environmental humidity, the temperature, the space size, air flow speed(windows or door closed or not) and so on. ✔ Compact & Quiet: Use peltier technology with no compressor makes it lightweight and quiet, the size is 11.8*9.8*7in, and noise is below 42dB with no annoying sound, offer quiet and sound sleeping. ✔ High-Efficiency: Max capability 1500ml(50fl.oz) for a long and non-stopping moisture, removes up to 550ml(18fl.oz) of moisture per day with 86°F (30°C) 80%RH. ✔ Auto Shut-Off: It will automatically shut off when the water tank is full and full indicator light will light up to inform you to empty the tank. ✔ Environmentally Friendly Consumption: Upgrade section dehumidifier with no chemical substances and low energy consumption, It Is an Ideal environmentally friendly solutions for absorbing damp and condensation. ✔ Perfect After-sale Service: 30 days money back or exchange guarantee, 24 months warranty with professional customer service team to provide friendly and fast support. If you have any questions about this product by Hysure, contact us by completing and submitting the form below. If you are looking for a specif part number, please include it with your message.